The weather was great this year, the sun nearly burning. Good that most experienced throwers had sun protection with them. 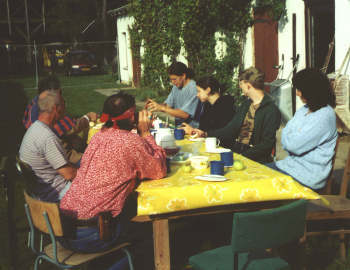 The meeting (like last years) was being held at the Little Big Horse Ranch, a horse-riding ranch in Müncheberg near Berlin, Germany. Friday (30. August) saw the arrival of the participants that had a long way to the ranch, and therefore preferred to sleep on site in the "riding chamber", the tipi, their car or in a hotel to be fresh next morning for the contest. The longest journey had Jos from Holland and Paco from Spain for sure. The evening was used to throw some knives, axes and stuff at the training targets. The old carpet that was hung behind it as backstop was quite useful. As it grew too dark for training, everybody gathered around the campfire and destroyed the meat that happened to lie on it. Nobody stayed up too late, since tomorrow would be the big day. Saturday began with a gemütlich breakfast in the sun. More and more participants arrived and started their warm-up throws (the contest-targets were tabu, though). At noon, an old-west soup was served directly from the hot cauldron over the fire. After that, one could register for the events and pay the little fee of 2,50 Euro for each. This time, it were nearly 30 participants! Christian Prestin, who organizes the meeting on his ranch, now officially opened the contest. To save referees (who last year would have also much liked to participate), the throwers had to take turns: seven throwers each got their "own" target and judged all the throws there, till all 21 throws of the other seven rotating throwing participants (three throws at each target) were complete. Then the places were swapped. One main-referee would be consulted in difficult situations. At each target, there was a secretary noting down the scores. 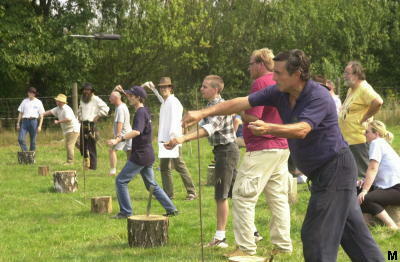 The following events were held: knife short (3m; men, women and "under 18"), knife middle (5,5m), knife distance, axe short (3m; men and "under 18"), axe middle (5,5m) and axe distance. The distance events had to be deferred till Sunday. The breaks between the events were used to enter the scores into the computer, so that the trophies could be awarded shortly after. The complete scores can be found in the tables below and Tim`s database. This year, there were not so many spectators, as the meeting was announced as for sportsmen only, to reduce the workload required to cater for all the onlookers and to be able to concentrate on the sport aspects. The throwers could learn about the schedule, rules and all at the websites promoting the event, LBHR.de, Messerwerfen.de and Axtwerfen.de. The day ended with a gemütlich round at the campfire. Everybody got new strength from the soup and meat, so it really got late till the last one went to bed (Franz slept right beside the fire, we really had a good weather). > Sunday saw a sunny breakfast again. After that, the distance events were held (Who can stick his tool from furthest away? Three tries from each distance, go back if you stuck a knife.) Many throwers did not stick even from their sure distance, perhaps some wear and tear from the day before. 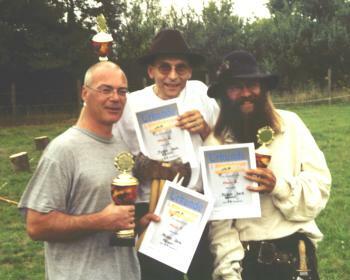 After the presentation ceremony, the word was "weapons free". Everybody could try out his fellow thrower`s tools, and play some games. Paco taught the throwing technique for his new knife. After another meal at noon, everybody headed home. I had very much fun at the meeting, and it helped me a great way with my throwing. Christian Prestin will of course host this meeting in 2003 again, and I am looking forward to meeting all those people I only email under the year. Many thanks to the press photographer Johann Müller from Döbberin for the pictures marked with M.
The official list with pictures can be found at the LBHR. The results are also in the database at StickingPoint. Axes with one and two blades heavier than 500g. Axes should be such (handle and head clearly distinguishable). With double-edged axes, only sticks with handle down count. 2,50 Euro starting fee for each event. At the short and middle distance events, one has 21 throws (seven targets, three throws at each). The knife will be scored after every single throw. One may leave it in the target. Before the three throws at each target, one may do a test throw, the participant has to declare in advance if he wishes to do so. Scoring: Bullseye black 6cm 4 points, first ring red 20cm 3 points, second ring white 40cm 2 points, third ring red 50cm 1 point. Heights of the targets: 1,35m up to 1,75m.